A.J. 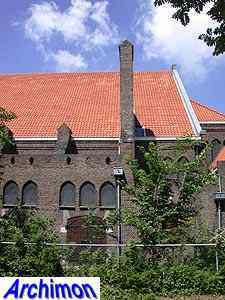 Kropholler's first true church, not counting the temporary church he built in Scheveningen in 1912, immediately shows that in the next decades this architect's style did not change. 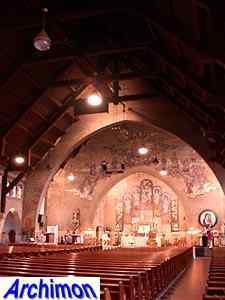 It's an aisleless building, although that aisle is quite wide and has side-aisle-like spaces at its rear half. 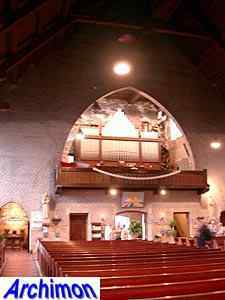 Already present here are the big but hardly functional buttresses, the small windows, the wooden roof and the sparsely but effectively used natural stone. 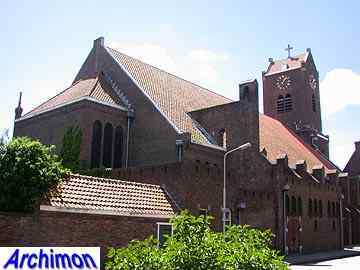 Just like all his other churches. 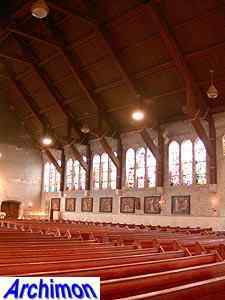 Kropholler also designed the presbytery. 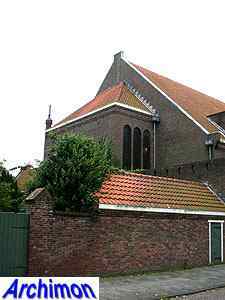 This church was built for a second catholic parish in Beverwijk, the other being the St. Agatha. 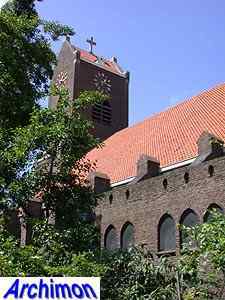 Due to changes in the borders between the two parishes the St. Agatha became a church of the rich and the middle class, while the O.L. 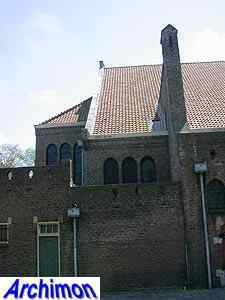 Vrouw became a workers' church. 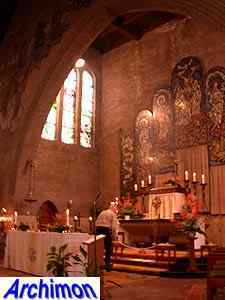 The ceremonial first stone was laid on October the 21st of 1914; at that moment work had already begun. 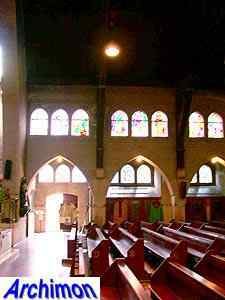 For financial reasons it had been decided to build the choir and part of the nave only, as well as the presbytery. 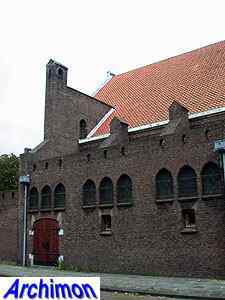 When work stopped in 1915, the uncompleted church was closed off with a blank, temporary facade. 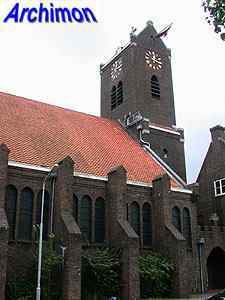 In the original design, a square tower with buttresses was to be build right in the middle at the front of the church. 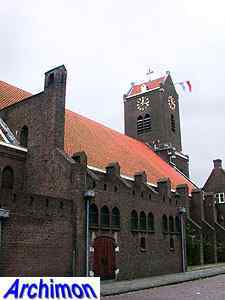 In 1927 work continued, when the church was extended with several traves to the west and a newly designed, rectangular tower with a saddle roof. 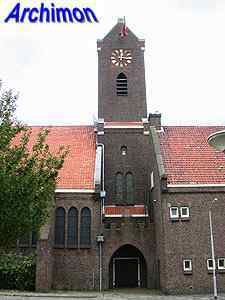 In 1922-1923 a school had been built at the front of the church, also designed by Kropholler. 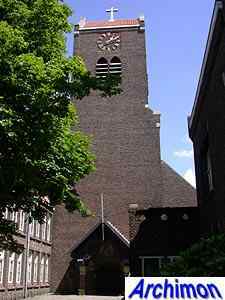 The church is of great importance, not only as Kropholler's first completed church, but also as the first christocentric church of the Netherlands; a church that was designed in such a way that all people inside would have an undisturbed view at the altar, which is placed in a well-illuminated choir behind a chancel arch. 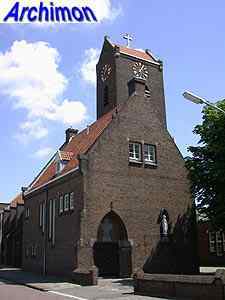 In 1989 the diocese of Haarlem decided that one of the two churches in Beverwijk was to be closed. 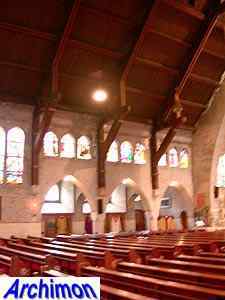 The decision to close the St. Agatha, an important design by Jos. 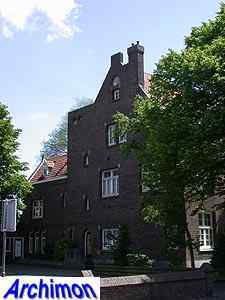 Cuypers, was later withdrawn. 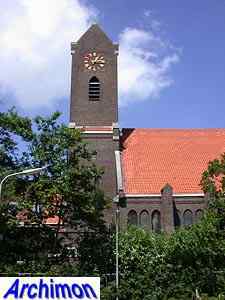 Instead, in 2010 the O.L. 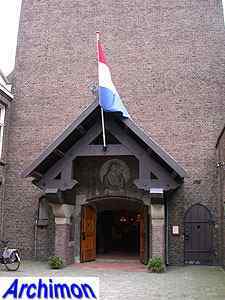 Vrouw was officially closed. 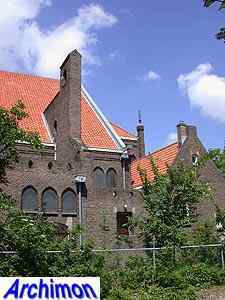 Although it's a protected building, its future is unclear.